The average hourly wage paid to full-time payroll employees in 2016 was $27.70, excluding overtime pay, tips, and incentive and performance pay. Wages varied notably across occupations and geographic regions. The data are drawn from the new wage component of the Job Vacancy and Wage Survey (JVWS), which provides wage information by both detailed occupation and economic region on an annual basis. All wage data provided are for full-time employment and exclude overtime pay, tips, and incentive and performance pay, such as commissions and bonuses. See the note to readers for information about this new component of the JVWS and how it was conducted. The JVWS provides information on wages by occupation paid to full-time employees using the 2016 National Occupational Classification (NOC). At the highest level of the NOC hierarchy, there are 10 broad occupational groups (one-digit NOC code), each comprising 24 to 80 detailed occupations (four-digit NOC code) at the lowest level of the NOC hierarchy. Management was the broad occupational group with the highest average full-time hourly wage in 2016, at $40.25. Engineering managers ($58.30) were among the highest paid within management occupations. On the other hand, restaurant and food service managers were the lowest paid, at $18.10 per hour. According to the Labour Force Survey (LFS), the average hourly wage of full-time employees in management occupations increased 5.7% from 2015 to 2016, the largest increase among all broad occupational groups. Full-time employees in natural and applied sciences occupations had an average hourly wage of $33.45 in 2016, compared with $33.20 for occupations in education, law and social, community and government services. Natural and applied sciences (94.0%) had the largest share of full-time employment among all broad occupational groups. Within natural and applied sciences occupations, petroleum engineers ($62.75) had the highest hourly wages. Conversely, landscape and horticulture technicians and specialists ($19.90) had the lowest wage. Within occupations in education, law and social, community and government services, university professors and lecturers ($58.10), and home support workers and housekeepers ($16.80) were among the highest and lowest hourly wages, respectively. Health occupations had an average full-time hourly wage of $31.80 in 2016. Within health occupations, specialist physicians ($86.75) earned the highest wage, which was also the highest wage of all occupations. One of the lowest hourly wages within health occupations was for nurse aides, orderlies and patient service associates ($18.95). Of the 36 detailed occupations within health occupations, nurse aides, orderlies and patient service associates accounted for 15.8% of full-time employment. Occupations in art, culture, recreation and sport had an average full-time hourly wage of $27.35 in 2016, almost on par with the national average for all occupations. Among the 33 occupations in this broad occupational group, librarians had a relatively high hourly wage, at $43.30. On the other hand, patternmakers for textile, leather and fur products ($14.80) and painters, sculptors and other visual artists ($18.00) earned among the lowest hourly wages. According to the LFS, average hourly wages in this broad occupational group decreased 3.7% in 2016 compared with 2015, the largest decline among all broad occupational groups. The average hourly wage of full-time employees in business, finance and administration occupations was $26.00 in 2016. Business, finance and administration occupations had the highest full-time employment, representing 24.8% of all full-time employment in Canada. Financial and investment analysts ($41.00) earned one of the highest hourly wages within this broad occupational group, while couriers, messengers and door-to-door distributors ($17.20) earned among the lowest. Trades, transport and equipment operators had an average hourly wage of $25.85 in 2016. Power system electricians ($39.80) earned among the highest wages within trades, transport and equipment operators. In contrast, taxi and limousine drivers and chauffeurs ($14.40) and air transport ramp attendants ($17.45) earned the lowest. Among the broad occupational groups, the lowest average full-time hourly wages in 2016 were in natural resources, agriculture and related production occupations ($22.15); occupations in manufacturing and utilities ($21.90); and sales and service occupations ($18.85). Certain occupations within these groups, however, were among the 10% of occupations with the highest hourly wages, such as oil and gas well drilling workers and services operators ($44.35). Within sales and service occupations, technical sales specialists in wholesale trade ($32.10) and bartenders ($11.50) had among the highest and the lowest hourly wages, respectively. There are 76 economic regions in Canada, each enclosed within a province or territory. However, seven pairs of economic regions were combined for this survey. In 2016, six of the seven economic regions in Alberta were part of the nation's top 10 for the highest average hourly wage. Wood Buffalo–Cold Lake, Alberta ($36.50), followed by Nunavut ($35.95), the Northwest Territories ($34.20) and Calgary, Alberta ($32.60) were the economic regions with the highest hourly wages. Among all provinces, Alberta had a relatively high average hourly wage in every broad occupational group except in art, culture, recreation and sport occupations, and in sales and service occupations. In contrast, the 10 economic regions with the lowest average hourly wage were located in the Maritimes and Quebec. Edmundston–Woodstock, New Brunswick ($19.40) had the lowest average hourly wage in 2016, followed by Campbellton–Miramichi, New Brunswick ($21.30); Prince Edward Island ($21.30); and Gaspésie–Îles-de-la-Madeleine, Quebec ($21.70). When ranking economic regions within each broad occupational group, average hourly wage in Edmundston–Woodstock ranked in the bottom 10% in 6 out of 10 broad occupational groups. The highest average hourly wage for management occupations was in mining, quarrying, and oil and gas extraction ($64.45). 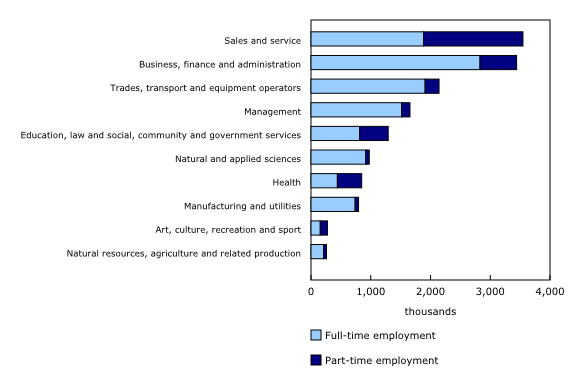 Of all full-time employees in management occupations employed in this sector, 64.7% were in Alberta. In contrast, full-time employees in management occupations in accommodation and food services earned $21.45 per hour. That is one-third of the average wage for management occupations in mining, quarrying, and oil and gas extraction. Sales and service was the broad occupational group with the lowest average full-time hourly wage in 2016 ($18.85). However, full-time employees in sales and service occupations working in professional, scientific and technical services earned $29.45 per hour on average. In contrast, full-time employees in this broad occupational group earned, on average, $13.70 in accommodation and food services. Of all full-time employees in sales and service occupations, 23.7% worked in the accommodation and food services sector. In the most prevalent broad occupational group in terms of full-time employment (namely business, finance and administration), the average hourly wage was among the highest in mining, quarrying, and oil and gas extraction ($38.95). In contrast, the lowest average hourly wage for this broad occupational group was in accommodation and food services ($20.00). The Job Vacancy and Wage Survey (JVWS) is made up of two complementary components: the job vacancy component and the wage component. The wage component provides comprehensive information on average hourly wages paid to full-time employees by detailed occupation and economic region. The results of the wage component are published on an annual basis. The JVWS is sponsored by Employment and Social Development Canada. It responds to key labour market information needs by providing critical data on current and emerging labour market. Results support decision making by job seekers, students, employers and policy makers. The average full-time hourly wage paid is the average hourly wage paid by employers, before taxes and deductions, to full-time employees and excludes overtime pay, tips, commissions, bonuses, haulage, kilometric or mileage pay, piecework rates, pension, and healthcare benefits. Estimates are calculated based on the number of full-time employees per occupation at the business location. As a result, the average wage by occupation is weighted by the location weight, the occupation weight and the number of employees reported in the occupation at each location. 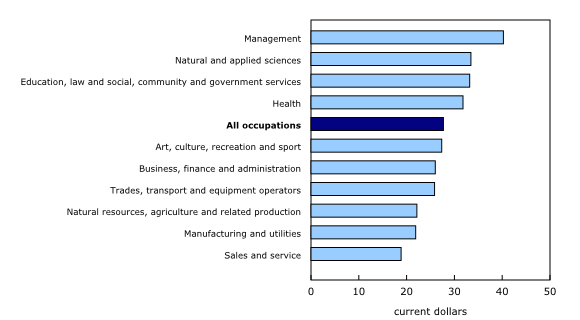 Occupations are classified according to the National Occupational Classification (NOC) 2016. The NOC is a four-tiered hierarchical structure of occupational groups with successive levels of disaggregation. The structure is as follows: 1) 10 broad occupational categories, also referred to as one-digit NOC; 2) 40 major groups, also referred to as two-digit NOC; 3) 140 minor groups, also referred to as three-digit NOC; and 4) 500 unit groups, also referred to as four-digit NOC. Industrial sectors are classified according to the North American Industry Classification System (NAICS) 2012. The NAICS has 20 industrial sectors at the two-digit level. In July, the job vacancy component of the JVWS will be publishing historically revised job vacancy estimates with the data release for the first quarter of 2017. These estimates will be calibrated on the revised employment totals from the Survey of Employment, Payrolls and Hours (SEPH) released on March 31, 2017. Data from the wage component are also calibrated to the revised SEPH employment totals. The target population of the survey includes all business locations in Canada, with the exclusion of those primarily involved in religious organizations and private households. While federal, provincial and territorial administrations are also excluded from the survey for now, they will be introduced later. Wages information from the JVWS for 2017 will be released in June 2018. More information about the concepts and use of data from the Job Vacancy and Wage Survey is available in an updated issue of the Guide to the Job Vacancy and Wage Survey (Catalogue number75-514-G). To enquire about the concepts, methods or data quality of this release, contact Myriam Hazel (613-219-4345; myriam.hazel@canada.ca) or Client Services (toll-free: 1-866-873-8788; statcan.labour-travail.statcan@canada.ca), Labour Statistics Division.